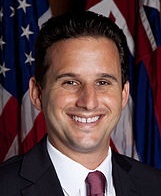 Brian Schatz is an American Jewish Senator (D-HI), businessperson, and environmental activist. Born in Ann Arbor, Michigan on October 20, 1972, to a Jewish couple originally from Canada, Schatz moved with his family to Hawaii at age two. He graduated from the Punahou School, and earned his B.A. in philosophy from Pomona College in Claremont, California. During college, Schatz studied in Kenya and participated in the International Training Program, through which he developed skills in public service. In the 1980s, Schatz became involved in environmental and youth services through Youth for Environmental Services; he later directed the Makiki Community Library, and the Center for a Sustainable Future. Schatz also served as CEO of Helping Hands Hawaii. In 1998, Schatz ran on the Democrat ticket for the Hawaii House of Representatives and defeated incumbent Sam Aiona. Since then, he has been re-elected three times. While in the Hawaii House, he served on numerous committees, including as chairman of the Economic Development and Business Committee. Other committes on which he served include Agriculture, Comsumer Protection and Commerce, Economic Development & Business; Higher Education; and two natural resources committees. In 2006, after serving four terms in Hawaii's House of Representatives, Schatz ran for U.S. Congress and lost in the Democratic Primary to Mazie Hirono, who won the general election for his district's seat. Schatz ran for Lieutenant Governor of Hawaii in 2010 after stepping down from his role as CEO of Helping Hands Hawaii. He ran on the Democratic ticket with Neil Abercrombie as Governor, and the pair won the Democratic primary election on September 18, 2010. That December, Schatz was inaugurated as Hawaii's 11th lieutenant governor. On December 17, 2012, incumbent Senator Daniel Inouye (D-HI) died at age 88. Sen. Inouye was a well-respected supporter of Israel in the Senate throughout his decades-long career. The Hawaii Democratic Party said Governor Neil Abercrombie could appoint one of three people to fill Inouye's seat and Schatz was among them. On December 26, Gov. Abercrombie appointed him to serve as Hawaii's senator and Schatz resigned from Hawaii's Lieutenant Governorship to serve in the Senate. Upon his swearing-in, Schatz was the youngest U.S. Senator in the 112th Congress. Schatz won the 2014 special election to complete the remainder of Inouye’s Senate term, and was reelected in 2016 for a full six-year term. Schatz is married to Linda Kwok Kai Yun; the couple has one son and one daughter. “Who Is Brian Schatz, the New U.S. Senator From Hawaii?” The Atlantic, (December 27, 2012).